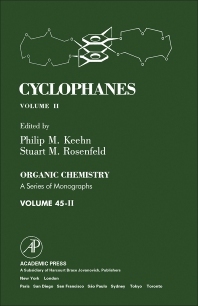 Cyclophanes, Volume II, provides a comprehensive review of the field of cyclophane chemistry for the period between the earlier volume in this series (Bridged Aromatic Compounds by A. H. Smith, 1964) and the present (generally through 1981). An attempt has been made to provide a selection of topics that delineate the past and present of cyclophane chemistry and point toward some of its future directions. The ordering of chapters has been chosen to present background, theory, structure, and spectroscopy followed by a somewhat arbitrary division of cyclophanes into subgroups, roughly in order of increasing structural complexity. Key topics discussed include the synthesis and properties of heterophanes, condensed benzenoid and nonbenzenoid cyclophanes, multibridged and multilayered cyclophanes, cyclophanes in host-guest chemistry, and cyclophanes as synthetic analogs of enzymes and receptors. Individual chapters have been written so that they may be read with little or no direct reference to other chapters. Each stands alone as a review of a particular area of cyclophane chemistry and therefore some overlap between chapters will be apparent.